Preserve the freshness of your baked goods and protect them during transport with this Regency 63" clear full-size bun pan rack cover. Featuring three reinforced zippers, this item allows your wait staff, caterers, or other employees to have easy access to products without having to remove the entire cover, saving them time and effort! Ideal for caterers, cafeterias, restaurant kitchens, bakeries, and more, this economical, plastic cover provides peace of mind in knowing that your food items are always protected from harmful germs or other debris. This is must have if you are into baking. A little too rigid to my liking because it is a little bit tricky to zip it. Besides that, I'm happy it. This is a great addition for my full size bun rack! It is so nice to be able to have a way to cover everything. It is really nice to be able to cover everything with this thick plastic cover. It fits very nicely on the rack and the zippers make getting to everything easy! We bought this bun rack cover for proofing our buns during the winter. It worked well but over time employees accidentally melted the plastic with hot pans. It’s also very difficult to clean. This clear plastic covering for your bun rack is a definite must! Helps to keep your items fresh and dust free. The zipper is quality and is easy to zip up and down. These are a thick plastic so they have a heavy duty feel, but they are difficult to move and if trying to put racks close in together, they will not "give" so plan on each one taking up a couple extra inches on all sides. I wish the zippers were more heavy duty to match the plastic, one already broke off. Thank you for your review, Francesca! 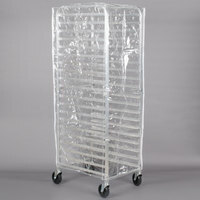 We are sorry this Regency 63 inch Clear 8 Mil Full-Size Plastic Bun Pan Rack Cover with 3 Zippers has not worked well for you. A Customer Solutions Representative will contact you soon! We purchased this bun rack cover in conjunction with the bun rack offered from Webstaurant. The quality is good for our purposes, it protects product during production stages. This is a must for any chocolatier/bakery. Since we make desserts in batches, instead of to-order, it's nice to have them stored away and covered, but on display at the same time. We only used the rack cover once. On first use there was a odor that needed to aired from the plastic. Plastic is also heavy and hard to unravel when trying to put over rack. Zipper could be a bit flimsy so have to be careful when zipping. Look forward to using again at some point. Thank you for your review, Amanuel! We are sorry this Regency 63 inch Clear 8 Mil Full-Size Plastic Bun Pan Rack Cover with 3 Zippers has not worked well for you. A Customer Solutions Representative will contact you soon! This is very durable plastic wrap that keeps your treats that doesn't need to be refrigerated soft and moist for several days. Its a good investment. Product was exactly as expected until I unzipped two sides and easily put it on my pan rack. Upon zipping up one side the zipper completely came off the end. I have not been able to re-attach the zipper. So now I have one side that hangs open, against health department code. This product was defective right out of the box. Thank you for your review, Eleanor! We are sorry this Regency 63 inch Clear 8 Mil Full-Size Plastic Bun Pan Rack Cover with 3 Zippers has not worked well for you. A Customer Solutions Representative will contact you soon! This rack cover works very well and is made of a heavy material - not one that I am concerned about getting torn. Just make sure to be able to have it on the rack a day or two before use with food, as it does have a strong plastic smell at first, but it dissipated quickly once on the rack. Well worth the money. Zipper sides to keep attached to the unit but easily accessible when needed. And though a thin mil, the zippers seem very sturdy and work well. This plastic bun rack cover is a must have!! it does a great job protecting all your goodies from dust or flies, it also keeps the baked goods from drying out. This cover fits perfectly over the baker's rack. The 3 zippers are convenient when taking sheet pans in/out. Keeping the cover closed helps to keep my cupcakes fresh! Works good but not sure how long it will last because the zippers aren't the best quality. But I guess for the price it really doesn't matter. Make sure to keep this away from anything hot. The cover fits perfect on our rack. The plastic is fairly thick and very durable. Zippers on each side make it easy to add or remove a tray without having to remove with entire cover. We are so glad we purchased this rack. Couldn’t be without it in the bakery. We use this constantly, everyday in our bakery. Great price, wish we had room for another one?? Great price for a decent product. Do not be too hard on these. They do not like cold temperatures, but do great in an ambient environment. If you are kind to them, you will have an excellent rack cover. This cover does the job, but it's very stiff and wrinkly. I wish it was a bit more malleable, easier to unzip, and completely clear. The wrinkles on the plastic do not come off, even after steaming. This bun rack cover is Perfect!!! The plastic is pretty strong too. It allows me to put my baked goods away until I’m ready to work on them. No need to spend more on a rack cover. This one does the job and is very easy to use. We were happy that it did not have a plastic or vinyl odor to it when it arrived. Works the way I wanted it. Can't really go wrong. I do have to say that when it arrived it had a very chemically smell to it that I had to let air for a few days before I could use it. We have been using this for about 5 months now since opening, and it definitely keeps our breads fresh. Has held up very well and would recommend. This cover is made of pretty thick plastic and fits the speed rack well. The price cant be beat and it handles constant in and out usage all day long at our bakery. The zippers are sturdy and the cover works great. The plastic is very clear. This is a must have to complete your Rack purchase. Helps to keep environmental items from flying into your baked goods or anything that you store within the rack. Highly recommend - great product. Fits my rack to perfection, zippers are super practical. No complain. I received the item that I needed as per description, and I believe this one is the most cost efficient. he plastic cover fits perfect, the zipper is a little flimsy , the plastic itself is very thick and drapes nicely, The cover is very clear. these are really handy if you are making bread at restaurant. no need to buy expensive proofers, let the natural enclosed humidity do its job, your end result will be better! Overall, nice product for the cost. Placed it over the rack with ease and the product covers the rack all the way to the bottom. I have taken a star away because 2 of the zippers out of the 3 has a zipper that do not close properly at the top. I am thinking it is because the product arrived with the top pulled apart already (not sure if this is manufacturing defect or shipping or storage damage) and the zipper cannot be opened all the way to the top where the zippers are pulled apart to be re-closed for proper seal. I do not think this will affect my use and decided to keep using it. A very durable rack cover. The side zips enable you to have full access to the rack without having to remove it completely. It definitely protects my chocolate from contaminants and keeps them fresh. I ordered these to keep my speed racks covered. They are very well made, good fitting and a great value for the price. I would highly recommend. Pretty good cover. A little hard to get the zipper started, but has held up well. Plastic is very thick and you will need to air them out for a bit when you first get them. I have really enjoyed having this cover for my rack! It definitely keeps my bakery items a lot more protected and fresh! I would definitely recommend this and it is great quality for the price!! These bun pan rack covers are pretty sturdy for the price. Won't last forever but you probably don't want them to. Easy to zip on and off. I had a little issue with delivery and these products. The product itself was fine... if I had all the parts. I ordered 3 and they all came with the same missing parts to hold the whole thing together. Customer service was quick to respond and to deliver parts, so for that I gave it 4 stars because they were actually very helpful. This cover works great on our full size bun racks! It keeps our product from getting full contact from the air around it. The cover also wipes clean easily. The bun rack plastic cover can easily slide over the top and zip down. They are easy to use and easy to clean. Just spray them down with the sink hose and dry them off on the rack.